The Nescafé Dolce Gusto Colors by De’Longhi is a fabulous coffee machine that coffee lovers will adore. There are over 40 different varieties of coffee to choose from and you can experience coffee-shop quality coffee in the comfort of your own home. 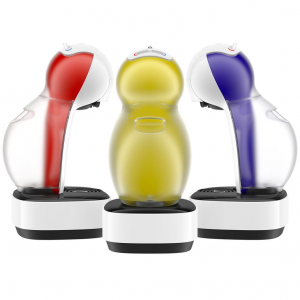 The Nescafé Dolce Gusto Colors machine has a unique design and is compact so it will fit perfectly in any kitchen. It also has 3 interchangeable coloured back panels so you can choose between intense blue, yellow and red. This brilliant coffee machine also has a maximum 15 bar pump pressure that allows you to make coffee-shop quality coffee with no mess and no fuss. You can create professional quality coffees with a thick velvety crema thanks to the machine’s high pressure system. The Dolce Gusto Colors is very easy to use, which is one of the features I loved. You simply choose the pod of coffee you would like, slide it into the machine and then customise your beverage size. You can choose a beverage size up to XL and once you have chosen the volume you desire, the coffee machine will automatically stop at the right moment. Another great feature is that this machine also has a convenient eco-mode feature that automatically turns off the coffee machine after 1 minute of inactivity. This gives the machine an A++ rating in energy consumption. This machine is also very easy to clean as all the coffee grinds stay in the pods so there is virtually no cleaning after it has been used. The Nescafé Dolce Gusto Colors is a fabulous coffee machine that will create wonderful hot and cold beverages for your home. It is available at www.johnlewis.com and other leading retailers. The RRP is from £69.99.